THIS IS MASSACRE, NOT WAR! Syria, who haven't heard of this country? Excepting the little kids who are yet to learn alphabet in the kindergartens and those in the far flung remotest of places where television is still a dream, Syria still is an unheard place. Excepting this very tender group pf people, almost everyone knows Syria. And sadly the place is know from it's wide association of WAR and conflict. Unlike in the past, of times we have known, the recent tragedy in Syria rips a heart away. 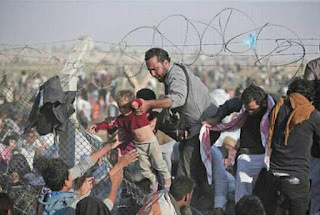 The massacre, people call it, Syrians have been trapped in the barrage of war. More than 700 people have been reported killed and the innocent children, hundreds of them are being killed. It looks like heaps of harvested cotton let to dry in the sun. And just a moment before they were wrapped in white, they might have been bunch of joys to the parents. And it's very hard to understand why they must pay for whatever reasons they are massacred for.